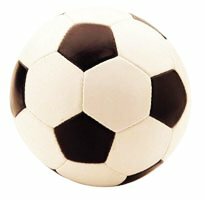 If you have been watching soccer these days you might have noticed that the ball looks different from what you are used to. 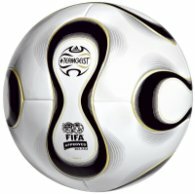 The new soccer ball for the world championchip 2006 in Germany is called Teamgeist. The Teamgeist soccer ball is claimed to be more round than its predecessors. The cut length is shorter. A discrete version of the standard old soccer ball is the classical truncated icosahedron known also as C60 bucky ball. A polyhedral version of the Teamgeist soccer ball can be seen (and rotated) in the window below. It's symetry group is a subgroup of the symetries of the cube. The number of vertices is 48, which seems to be minimal for the realization of the Teamgeist structure. The Haussdorf distance of the Teamgeist polyhedron presented above to the unit sphere is minimal and is equal to 0,044. The polyhedron was created by Stefan Sechelmann ( DFG-Research Unit "Polyhedral Surfaces" ) using a java application based on Alexandrov's theorem on a polytopal realization of a convex polyhedral metric.